In 1681, French-born Denis Papin made a unique discovery after an unfortunate accident with a pressure cooker. Papin’s attempts to extract fat from animal bones in a steam induced high-pressured container were a failure when the vessel exploded. However, before the unfortunate termination of his experiment, Papin had observed how the steam raised the lid of his pot. It was the inspiration Papin needed to conceive a prototype steam driven piston. Papin’s experiment in its turn formed in 1705, the basis for Thomas Savoy’s steam engine, which played such a vital role in the early industrial revolution. Papin’s chance invention, however, was not the first steam engine. The ancient Greeks had already been playing around with the uses of steam from the fourth century BC. 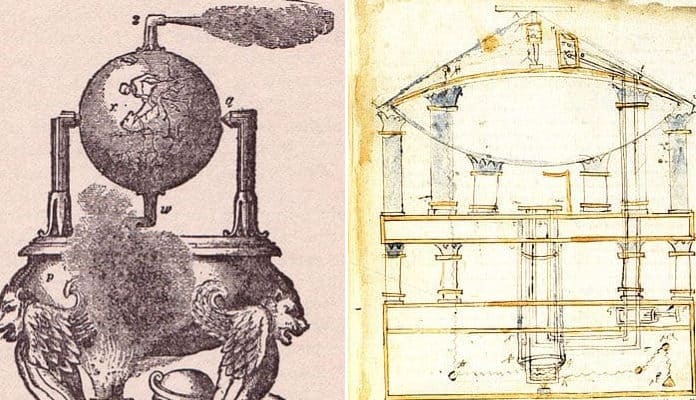 However, the invention of the first steam-propelled mechanism, the aeolipile, dates to the first century BC and can be credited to Hero of Alexandria, an Alexandrian scientist and inventor. Although classical scientists never fully explored the potential of Hero’s aeolipile in ancient times, its technology may have informed steam-based technology even before Papin’s time. Hero of Alexandria was a mathematician, physicist and engineer who lived and worked sometime during the first century BC and who established and ran the Higher Technical School in Alexandria. During his tenure as the school’s director, Hero taught and lectured students as well as continuing with his own research projects. Hero was particularly involved in building upon the work of Ctesibius, one of the greatest mechanical inventors of the ancient world and a fellow Alexandrian who had lived two centuries previously. Hero’s lecture notes and other papers on physics, mechanics and maths were well thought of as they were replicated often enough for an impressive number of them to survive to this day. Their subject matter was varied. In his Hydria, Hero explored the mechanical uses of water while his Belopoetica, (which was influenced by the fourth-century BC Athenian architect, Philon and Hero’s contemporary, the Roman engineer Vitruvius); the tutor and engineer explored new design for war machines. Fourteenth-century copy of an automat, of Bacchus figure dispensing wine and milk in a small temple, designed by Hero of Alexandria. Wikimedia Commons. Public Domain. Some of Hero’s ideas were particularly original. In On the Dioptra, Hero explored the possibility of measuring distances using astronomy. He took as his example the distance between Rome and Alexandria, using an eclipse of the moon as his astronomical benchmark. Hero observed the differences between the local times in each city when the eclipse was visible to calculate the distance. In 1938, Hero’s description of this eclipse allowed science historian Otto Eduard Neugebauer to match it with the event which took place in Alexandria at 11 pm on March 13, 62BC- thus establishing Hero’s period as the first century BC. It was Hero’s Pneumatics, however, that tackled the subject of Invention. The volume divided into two books, both of which explored various mechanical devices which, when driven by air, water- or steam- replicated the movements of living things. The book contained many novelties that Hero used as teaching devices for his students. One example was a puppet theatre, where a combination of drums and weights moved the strings of the ‘players’. Another similar device was a steam operated ‘temple wonder’ that turned out to be well ahead of its time: the aeolipile.